The Majmaah Journal of Health Sciences (MJHS) enters its second year of publication and I believe the aims that we set for the MJHS continue to be valid and to a certain extent; achieved. The mission of the MJHS is to promote basic, translational and clinical research with the overall goal to improve the health status in the Middle East region. The vision is clear: to become a prominent journal of the highest quality in this region. The main objective of MJHS is to educate and inform, to awaken a critical spirit and foster observational skills and to facilitate the expression of the abilities and preoccupations of the health professionals. For most professionals, what is important is their work, such that we are aware that there may be great interest in reading the journal but less in publishing in it. I strongly encourage our readers and professionals from the academic, clinical and scientific community to utilize this platform to share their research findings by publishing in MJHS. If you believe, you have the ability to critically review manuscripts that are submitted for possible publication in the MJHS, I encourage you to consider sharing your knowledge and talent with us. You should know that reviewers are not obligated to review articles whenever requested. If you are preoccupied, it is acceptable to decline the invitation without negative consequences. MJHS is appreciative of its energetic team members. These team members have devoted themselves diligently to make the timely publication of MJHS a reality. I am confident that with their continuous diligence, MJHS will achieve our goals of recognition in the near future. The role of Editor-in-Chief has been a learning experience for me thus far, and I continue to learn each day. I am also extremely grateful to the Editors for their valuable input and their hard work and to the Editorial Board for their wisdom, guidance, and commitment. Mohammad Othman Al Rukban. Foreword. Majmaah J Heal Sci. 2014; 2(1): -. Mohammad Othman Al Rukban. Foreword. http://www.mjhs-mu.org/?mno=289897 [Access: April 25, 2019]. Mohammad Othman Al Rukban. Foreword. Majmaah J Heal Sci. (2014), [cited April 25, 2019]; 2(1): -. Mohammad Othman Al Rukban (2014) Foreword. Majmaah J Heal Sci, 2 (1), -. Mohammad Othman Al Rukban. 2014. Foreword. Majmaah Journal of Health Sciences, 2 (1), -. Mohammad Othman Al Rukban. "Foreword." Majmaah Journal of Health Sciences 2 (2014), -. Mohammad Othman Al Rukban. "Foreword." 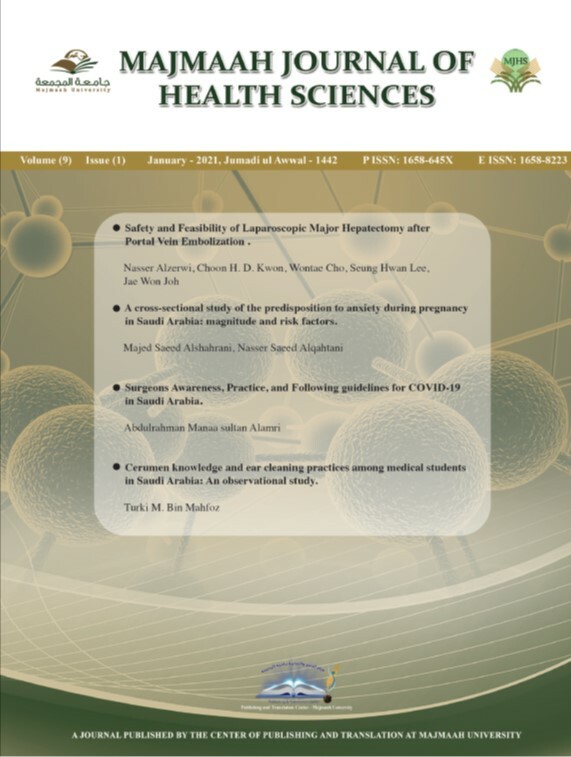 Majmaah Journal of Health Sciences 2.1 (2014), -. Print. Mohammad Othman Al Rukban (2014) Foreword. Majmaah Journal of Health Sciences, 2 (1), -. Majmaah J Heal Sci. Year: 2014, Volume: 2, Issue: 1: -.